What's black and white and red all over? 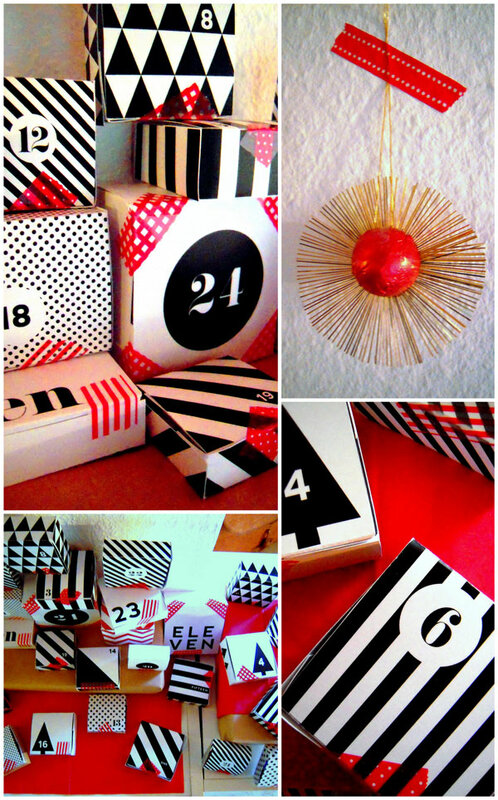 No, not the newspaper; this year it's the Advent calendar I put together for my husband. 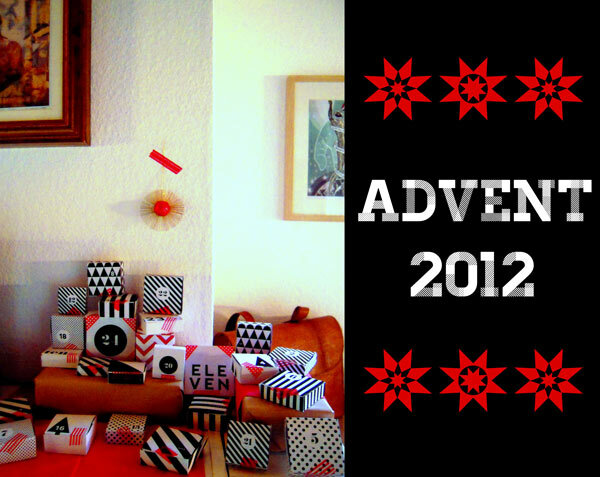 Yes, we make each other Advent calendars every year and yes, we know it's slightly immature, but it's fun, so who cares? It's the one time a year I can count on him exercising his creative muscles to fill the slightly generic calendar he uses for me. It's the one time a year he can count on me redecorating a corner of the living room just for him. We have fun with it. I used this black & white free printable set from Hey Look and added a red & white 25th box from Sweet Muffin Suite (love her stuff). I wasn't sure about having a black and white calendar for him, but the fact that I wanted little boxes and needed a template made me just go for it. I totally underestimated the amount of time I needed to cut, score and fold all these boxes and was up until midnight on November 30...lessons learned for next time. Also, I think I'm underskilled with paper crafting and my boxes rarely stayed closed, so I just used some red & white tape I had from Ikea and ended up having some festive color added, which was a nice bonus. Anybody else make an Advent calendar this year? How'd you do it? What did you put inside? We usually always have at least Bible verses and chocolates in ours. This year I added in some activities and smaller gifts; my husband usually gets me little gifts like masking tapes, tea, and things from the Body Shop. He says he buys me stuff because he can't make me stuff, ha! I like the black and white idea! So modern! That joke so totally gave me flashbacks to my grade school days... I still laughed! Just coming up for air and saying hello... hope all is well. I love the color and the graphics. I made an Advent calendar a few years ago for Sam and it totally stressed me out. I haven't made one since. Kudos to you for continuing your tradition. I LOVE it! And I think it is the sweetest thing in the world that you do this for each other!